Bill Cameron (pictured left) host of “The Drive” radio show spoke to the Rotary Club of Auburn, Alabama on Auburn 5, 2015. Cameron gave an overview of the Auburn University football team and shared his high expectations for the 2015/2016 season. 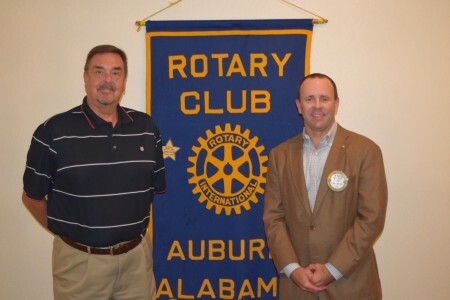 Pictured are Cameron and Brad Wilson, President Auburn Rotary Club (right).